Try reading this book without thinking about how, in 1945, your own grandfather was on a boat to the Pacific, leaving his pregnant wife and baby daughter behind so he could go fight the Japanese. And how, on his way there, the bomb was dropped over Hiroshima and Nagasaki, so instead of fighting he joined one of the first occupation forces in Japan. Try to imagine him coming from Idaho to Okinawa, and how his young heart broke for the suffering of the Japanese people. And how his heart broke all over again when he opened the letter from home that carried a picture of his new baby girl in it, and how he fell to his knees and wept for the child he hadn’t met and the family he wouldn’t see for a year. And how you always felt empathy for your grandfather–who worked so hard for so little throughout his life–but after reading this book you realize that he was indeed among the lucky of his generation. Try to read this book without looking back just a generation or two in your own family and finding that you are not as removed from history and tragedy and triumph as you think. 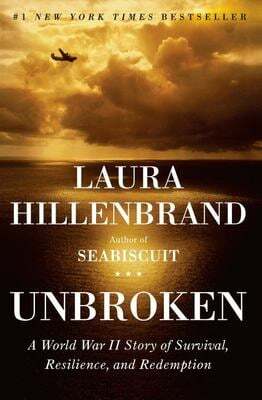 Try to read this book without fathoming how horrific bombs and beatings and starvation and maggot-infested wounds are, but how beautiful are strength and courage and Red Cross packages and the indomitable human spirit, too. And just try to read this book without a renewed appreciation–awe, even–of how insanely blessed we are because of our predecessors’ sacrifices, and what sunlit lives we lead as freedom-loving citizens of (I’m gonna say it) the greatest country on earth. Just try to read this book. Period. Previous Article I have a temper. Next Article A word on talents; or, Jenny-Claus is comin’ to town.